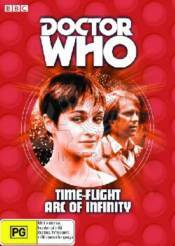 Two classic episodes featuring Peter Davison as the fifth Doctor. Time Flight sees The Doctor at Heathrow Airport investigating the in-flight disappearance of a Concorde. Arc Of Infinity sees an antimatter creature targeting The Doctor for survival.